Do you provide pick-up service from JR Datemombetsu Station? We're sorry, a pick-up service between JR Datemombetsu station and our hotel is not available. Please take a bus or taxi instead. Donan bus is available for Otaki-higashi-danchi or Kutchan-eki-mae via Kitayuzawa Onsen. Please get off at Shirakuni-no-Toko. It will take approximately 50 minutes. Do you provide pick-up service from New Chitose Airport? Yes, we have a shuttle bus service between New Chitose Airport to our hotel (one way 1,000 yen for 1 seat). ※Bus time table will change to following below from 2019.Oct.1st. 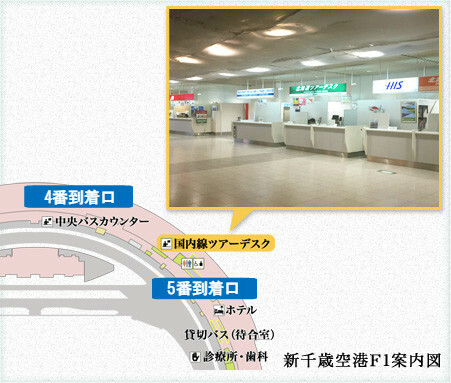 The designated meeting place is located on Domestic Flight Tour Desk; Amusement Hokkaido Service counter between Gate 4 and 5, ground floor of the New Chitose Airport. The fee is one way 1,000 yen for 1 seat. The departing time schedule is very punctual.Please note that in some circumstance, we may not be able to adjust this for advertised, due to your flight delay. Please note that the shuttle may not arrive at the time on traffic conditions. Please note that neither Midorinokaze Resort or the bus company will not be responsible for the loss of your luggage and/or personal belongings. If you plan on using the bus service, reserving this in advance is essential. Cancellation fee will be charged for this shuttle bus. If you cancel the bus on the day of arrival or No-Show (In case you don't contact us beforehand), the charge will be 100%. Please contact us if you arrive later than stated in reservation. Otherwise, it may be treated as a cancellation. Do you provide pick-up service from JR Sapporo Station? Yes, we have a free shuttle bus service from JR Sapporo Station to our hotel. The designated meeting place is located on Kaneno Hiroba(鐘の広場) on the North exit of JR Sapporo station. Our staff will be waiting for you from 13:00 - 13:30. The departing time schedule is very punctual. Please note that in some circumstance, we may not be able to adjust this for advertised, due to your flight delay. your luggage and/or personal belongings. MAP CODE is 603 723 494, if you will drive. Copyright©All Right Reserved. NOGUCHI KANKO CO,Ltd.